There’s nothing I love more than a weekend away or a city break. Although if you’re following my Instagram you’ll be well aware of this by now. Over the past 6 months, I’ve been trying to have as many mini breaks and spontaneous trips as I can. It doesn’t matter if it’s a few days abroad or a long weekend in London. The trick is to find cheap travel (whether it’s trains or flights) and somewhere nice but affordable to stay. I wouldn’t say I’m a total snob when it comes to hotels but I prefer to be somewhere stylish and affordable than roughing it. So when I was planning my last trip to London, Citizen M seemed like the perfect choice. Having visited their Times Square hotel in New York for a drink, I knew their hotels were always well located, modern and chic. Located at Bankside, right next to the Tate Modern and Borough Market, it’s pretty central and an ideal spot for a weekend break in London. With 192 identical rooms, Citizen M is one of those hotels where you know what you’re getting. The well designed rooms offer a super comfy XL king size bed with soft white linen, wall to wall windows and a free fridge of goodies, movies and wifi. All the essentials! 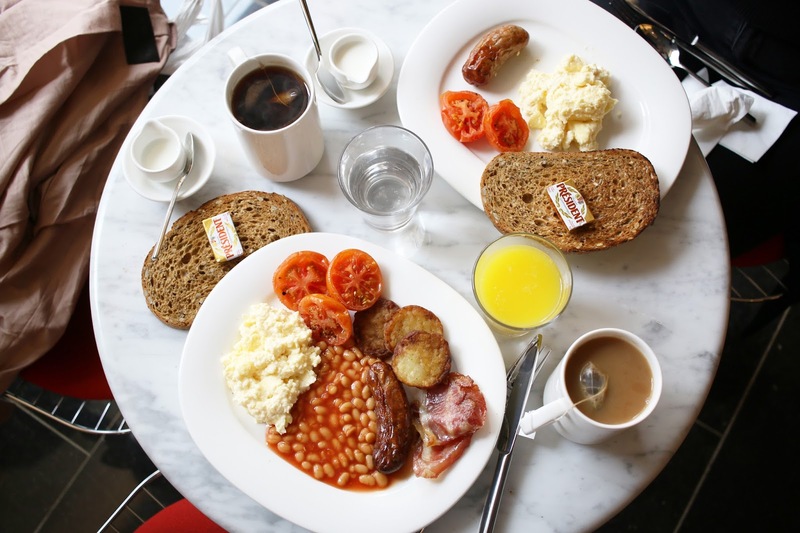 Not to mention one of the best all you can eat breakfasts offering both continental and Full English options to start your day right. Having only visited London a handful of times, I’ve actually never visited Borough Market. Usually I’ve stayed on the other side of the city, so I’ve never had much of an excuse to see the market. But staying just around the corner from it, made it an ideal place to spend a few hours before heading into the city. Like any great market, Borough Market isn’t the sort of place to rush around, racing through a shopping list. With its maze of fruit stalls, flower stands and food traders, it’s the kind of place best enjoyed slowly, without any real purpose. And with an empty stomach! As one of London’s biggest and oldest markets, Borough Market is something of an institution. Locals and tourists alike crowd its stalls on a weekend and with its mixture of local produce and artisan sellers, prices vary from reasonable to ridiculous. And you can get your hands on anything from beautiful bouquets to street food. You could spend hours mulling over which type of French torte to try or what doughnut filling would be best. It doesn’t matter how much breakfast you’ve stuffed yourself with. As soon as I could smell those delicious fresh cooking smells, I couldn’t resist. If you pass the Bread Ahead stall make sure you grab one of their salted caramel doughnuts. They’re filled with homemade caramel cream, topped with a piece of honeycomb and completely worth all the calories! Special thanks to Citizen M for sponsoring this post. Ah I love this. The flower stands are so gorgeous. I was in London not so long ago for the first time & completely loved it!